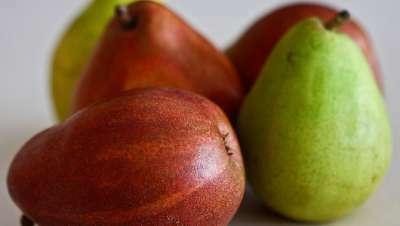 Just a little different, this large conical Pear develops a beautiful rich red colouring when baked and also a rich, buttery flavour. The fruits are pale yellow/green with only a slight brown-red flush which makes the colouring of the cooked fruits even more surprising. A hardy and productive tree. Good pollinators include Josephine de Malines, Invincible, Onward, Concorde, Sensation etc.